By Scott Gilfoid: Eddie Hearn’s November 24th card in Monaco will see Kal Yafai, Frank Buglioni, Denis Lebedev and Zhilei Zhang in separate fights. The card is taking place at the Casino De Monte Carlo, in Monaco. The card is pretty horrible in terms of competitive fights between guys that the boxing public are interested in seeing. The reaction today to Hearn’s announcement of this card has been bad. Hearn’s addition of 6’6” Chinese heavyweight Zhilei Zhang (20-0, 16 KOs) to the November 24 card in Monaco has boxing fans believing that he’s setting up a future fight between him and Anthony Joshua for the near future in China. Matching Joshua against the 35-year-old Zhang will help Hearn open the Chinese market for his Matchroom Boxing/DAZN cards. If Hearn can sell his DAZN cards to China, he could make massive money. If nothing else, Joshua vs. Zhang would be a huge fight in China. It wouldn’t register elsewhere, as Zhang is an unknown in the UK and the U.S. For the boxing fans that do remember, Joshua squeaked by Zhang in beating him by a narrow 15-11 score in the 2012 London Olympics. Zhang is just one of four controversial victories for Joshua in winning the Olympic gold in the London Olympics that year. Joshua appeared to lose three of his matches to Roberto Cammarelle, Ivan Dychko and Erislandy Savon, but with the generous scoring by the judges, he was able to walk away with a controversial gold medal while fighting at home. Joshua vs. Zhang was a fight that could have gone either way. I remember scoring it for Zhang by a narrow decision, as he was the better man in the fight. However, the cheering from the pro-Joshua crowd in London might have influenced the judges to score the fight for him over the big 6’6” Zhang. Like Joshua’s other three fights in the 2012 Olympics, the scoring for the Joshua-Zhang fight looked off. – Khalid Yafai vs. Israel Gonzalez – Yafai (24-0, 15 KOs) is fighting recent knockout victim Gonzalez (23-2, 10 KOs) for some reason. It’s a strange move for Eddie Hearn to match Yafai against a fighter who was knocked out earlier this year in the 10th round by IBF super flyweight champion Jerwin Ancajas. Gonzalez was beaten up and dominated by Ancajas, and now he’s about to get another world title shot against Yafai. Hearn must have his reasons for making this mismatch. It looks bad though, as if Hearn doesn’t have faith in Yafai that he can beat better fighters than Gonzalez. At the very least, it gives the impression that Hearn doesn’t have any ideas when it comes to picking out opposition for Yafai to defend his WBA ‘regular’ 115 lb title against. 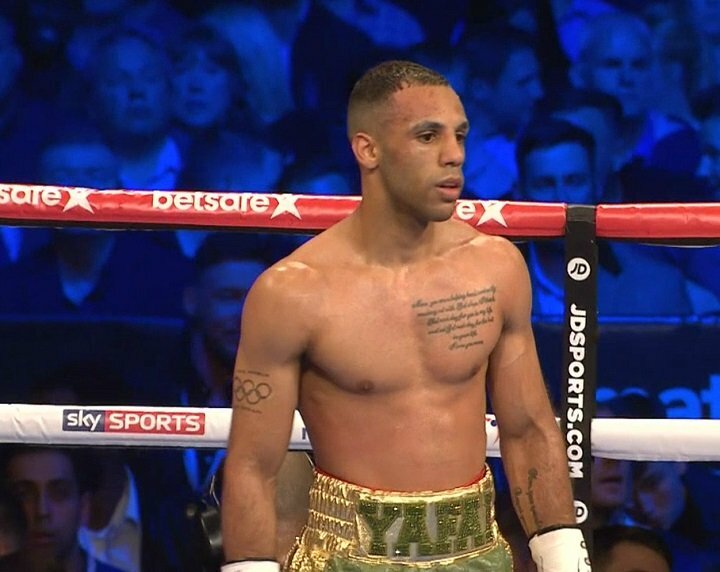 Yafai’s last fight was against David Carmona (21-6-5, 9 KOs), a fighter who had lost three out of his last four fights going into his title shot. With a record of 1-3, Carmona was selected by Hearn to challenge Yafai. Boxing fans were speechless when they saw this poor match-up for Yafai. Hearn is now continuing his weak match-making for Yafai by having him face Ancajas’ leftovers in Gonzalez. It’s hard to believe there’s no one better than Gonzalez for Yafai to fight. Surely, Hearn can find better than this, can’t he? This is Yafai’s fourth defense of his WBA title. He says he wants to fight Roman ‘Chocolatito’ Gonzalez, but that doesn’t look like it’s going to be happening anytime soon. Hearn has the money to setup a fight between Yafai and WBC champion Srisaket Sor Rungvisai, but he’s not making that move for some reason. Does Hearn doubt whether Yafai can hang with Rungvisai? It’s disappointing that Hearn isn’t banging the drum for the Rungvisai fight for Yafai. Hearn is always talking about how good Yafai is, and yet he still hasn’t pushed to match him against Rungvisai or even the likes of Juan Francisco Estrada. – Denis Lebedev vs. Mike Wilson – WBA Champion in Recess Lebedev (31-2, 23 KOs) will be fighting unbeaten 35-year-old Mike Wilson (19-0, 8 KOs) in a fight that will likely be a mismatch. Wilson is unbeaten, but he’s fought nobody of note. This fight will probably end quickly with Lebdedev destroying Wilson. I see the fight as bad TV. Wilson was stopped in the 1st round by Roberto Cammarelle during his amateur days. – Frank Buglioni vs. Fanlong Meng – Former British light heavyweight champion Buglioni (23-3-1, 16 KOs) will be trying to keep his career alive with a fight against 2012 Olympian Fanlong Meng (13-0, 8 KOs), who comes from China. Buglioni and Meng will be fighting for the vacant International Boxing Federation Inter-Continental Light Heavyweight Title. Buglioni was knocked out in the 1st round by Callum Johnson last March. Buglioni made the mistake of going straight at the hard hitting Johnson, and he was quickly taken out. I’m sure that if Buglioni had the chance to do it all over again, he would have been on his bike for the first eight rounds until Johnson tired out before he tried to engage the big slugger. Johnson almost knocked out IBF light heavyweight champion Artur Beterbiev in their fight earlier this month on October 6. Buglioni came back from his loss to Johnson by stopping journeyman Emmanuel Feuzeu in the 6th round on July 28. Hearn hasn’t given up on the 29-year-old Buglioni yet. The way that Buglioni has fallen apart when stepping it up against good opposition in Beterbiev and Fedor Chudinov, it’s unclear what Hearn’s end game is for him. – Zhilei Zhang vs. Alexander Ustinov – Zhang (20-0, 16 KOs) appears to be getting groomed for a world title shot against Anthony Joshua in China. Ustinov, 41, will give Zhang a good little test. Ustinov, 6’7″, was beaten in his last fight by Manuel Charr by a 12 round unanimous decision last November in a failed attempt to win the vacant World Boxing Association ‘regular’ heavyweight title. The card lacks a huge name involved in a high level fight unfortunately. Hearn has stacked the card with a lot of older fighters involved in mismatches. For example, Lebedev is 39-years-old facing the 35-year-old Mike Wilson in what shapes up to be a horrible mismatch on paper. Zhang is 35-years-old facing 41-year-old Ustinov at heavyweight.